Vision range of Soldiers decreased from 575 to 350. Base damage of soldiers decreased from 50/55/60/65/70/75/80/85/90/95/100/110/120/130/140/150/160/170 to 50/52/54/56/58/60/63/66/69/72/75/85/95/110/125/140/155/170. Bonus AD ratio increased from 0.55/0.7/0.85/1/1.15 to 0.95/1/1.05/1.1/1.15. Base shield strength increased from 40/80/120/160/200 to 40/100/160/220/280. Bonus damage-per-level increased from 8 to 10. Base damage decreased from 60/110/160/210/260 to 50/100/150/200/250. Auto-attack range decreased from 550 to 500. Cooldown decreased from 18/14/10 seconds to 16/13/10. Stun duration decreased from 2 seconds at all ranks to 1.6/1.7/1.8/1.9/2. Cooldown increased from 150/110/70 seconds to 180/140/100. Base damage increased from 13-192 (increases with level) to 15-235. Shield AP ratio increased from 0.25 to 0.3. AP Ratio of active (%) increased from 0.04 to 0.06. When out of combat, the active now gives Sona 16/17/18/19/20 [+0.07 AP] % bonus Movement Speed for 7 seconds. Zyra’s passive turns off while she’s in brush to prevent seeds from revealing her location. If she reveals herself by casting an ability or attacking, her passive turns back on. Since Recall is technically a spell, it was re-enabling Zyra’s passive, even though Recall itself doesn’t reveal you from brush. This is a fun one ;P Baron was able to kill Braum in one hit with his Acid Shot if Braum moved in front of a target within a very specific time period and cast Unbreakable. Each of the missiles from Acid Shot “dies” after it hits the ground, and Braum’s E was intercepting that “death”. We made it so Unbreakable ignores that particular effect. Because of how Yasuo’s passive interacts with crit, he sometimes ran into rounding errors with crit runes (every other source of crit is a #cleannumber so rounding’s not an issue). We adjusted some of the background math to fix this inconsistency. When Annie dies, Tibbers goes berserk and tries to kill the champion that killed Annie. If extremely unluckily timed, that AI could be overridden by a simple movement or attack command made at the exact moment Annie died. We added a short buffer so Tibbers ignores any command received after Annie dies. When we last worked on Veigar (BelugaWhale I’m looking at you O_O), we did a bit of file cleanup to make him easier to work with in the future. In the process, we removed the line that told Bad Santa Veigar to use special visuals for W. Fixing this one was a matter of diffing* his previous files with the updated ones, and re-adding the line that went missing. *Diffing means comparing two versions of the same file. “Difference”. Yeah. Please let us know if you find this kind of information interesting! Pool Party Fiora is ready for some fun in the sun – with her pool noodle sword! Fun Development Fact: We named the crab in her recall, “Kelly the Krab” after the artist that suggested a fencing crab! She has special tech on her pool noodle sword that makes it a bit wobbly! 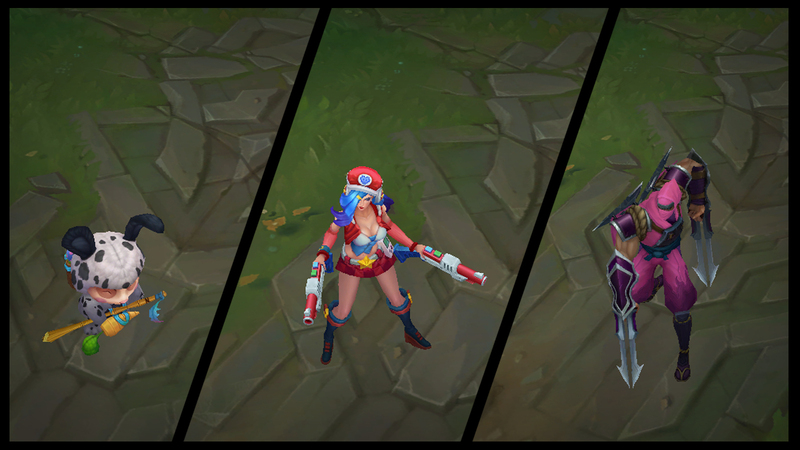 PBE Bugs & Feedback Thread: Pool Party Miss Fortune! Pool Party Taric is ready to keep an eye out to make sure everyone’s safe on the Rift! Tooltip now correctly states that the stun duration is 1 second at all ranks, not 1.25. Base damage decreased from 60/110/160/210/260 to 60/100/140/180/220. Duration of root increased from 0.25 seconds at all ranks to 0.5. Incandescence: Leona’s next 3/4/5 basic attacks gain 100 bonus range and deal 40/70/100 [+0.2 AP] bonus magic damage. New voidlings no longer spawn when a voidling attacks an enemy champion, jungle monster or kills/assists in killing a lane minion. Instead, Voidlings now spawn every 4 seconds or whenever a Voidling kills/assists in killing a lane minion. Bonus Movement Speed on active increased from 27/29/31/33/35% to 32/34/36/38/40. Stun duration increased from 1.6/1.7/1.8/1.9/2 seconds to 2 at all ranks. Aura duration is no longer extended by up to 2 seconds when “tagging” allies. Base shield on active changed from 35/55/75/95/115 to 30/55/80/105/130. Active now additionally grants Melody: Grants 10/11/12/13/14% Movement Speed for 1.5 seconds and on next basic attack within 5 seconds, allies gain 50/55/60/67/70 [+0.15 AP] bonus flat Movement Speed for 2 seconds. No longer passively buffs Sona’s basic abilities; instead, it now grants her 20/30/40% bonus Cooldown Reduction for Q, W and E.
Bonus Movement Speed (outside combat) increased from 15/30/45 to 25/50/75.